UDAYAPUR, July 16: A decade ago, Prabhu Narayan Chaudhary of Udayapur Rural Municipality-7 used to have his house filled with grains. His farm around the house used to be abundant with agricultural yields. Irrigation was easy and convenient with water available from the nearby Balan River. The situation has taken a drastic turn of late. He has neither his house nor the farms. The very Balan River that brought agricultural prosperity has taken it all away. The river swallowed everything he owned last year. Balan River had started eroding his farms since the past five years. He had one bigha of farmland remaining. But the river washed the farm along with his house, displacing him completely. Balan River that flows through the Chure range has changed its course and now flows directly toward the nearby settlement in the rural municipality. After being displaced due to the river's new route, he relocated himself to Udayapur Rural Municipality-9. Chaudhary blames extensive destruction of the Chure range for extraction of raw materials as the main reason why the river changed its course and displaced his family. “Some people from Bhakure JCV Crusher Company filled their pockets. But it led to the displacement of the poor people like us,” he rued. “The change in the river's course toward our settlement eroded arable lands of many locals, depriving us from our main source of income,” he added. He recalls the time when the Chure range was filled with greenery and when the Balan River had been a boon to the farmers. But now, with the extensive destruction of the Chure range, the wrathful river has become a curse for them. According to Lok Bahadur Khapangi, various crusher industries in Siraha and Saptari are blatantly involved in illegal excavation of minerals from Chure. Many of the extracts are sold to contractor of the under-construction Postal Highway. Tippers load the extracts and transport them to the construction site at night, he added. The unabated extraction of Chure is also affecting other areas. Vhalaya Dada, Risku, Jogidaha, Hadiya, Sundarpul among other settlements are increasingly facing water shortage as their water sources are drying up. The villagers claimed that destruction of Chure is the main reason behind it as they had abundant sources of water in the past. 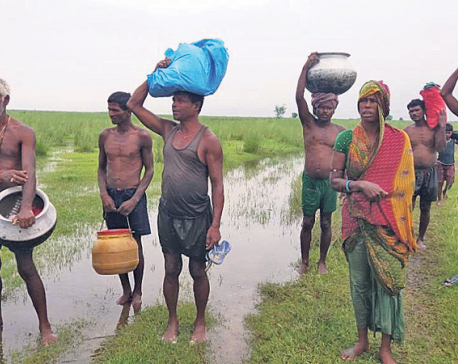 Many of the villagers are now preparing to migrate to other places as their livelihood is getting increasingly difficult due to shortage of water and other problems led by the destruction.